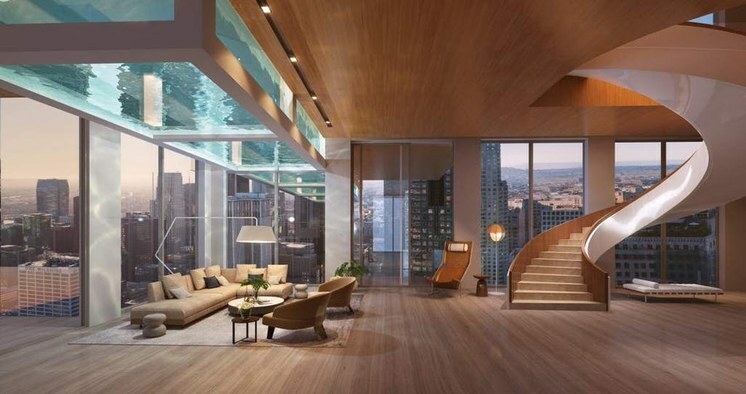 Rendering of a 53-story tower with cantilevered, glass-bottom pools for residents on the building's upper levels, designed by Michael O’Boyle at Arquitectonica’s LA office. Photo courtesy of JMF Development Co.
Let’s start with the crazy looking tower with the swimming pools that seem to float in space. It’s not real -- though some variant of it may enter the skyline. This is a proposed 53-story tower that would be at Fifth and Hill streets in Downtown LA’s Pershing Square. An interior rendering of the proposed Pershing Square tower. Image courtesy JMF Development Co.
It’s by a developer named Jeffrey Fish and the lead designers are Arquitectonica, the famed Miami-based firm with an LA office. The designers came up with this Jenga-like tower with terraces and a dozen long, thin acrylic-bottom swimming pools that cantilever out from all sides of the building. In addition to condos, the building would hold a bar and restaurants, and potentially a hotel. Fish says he was inspired by midcentury California architecture, with its climate-inspired indoor-outdoor lifestyle -- and that is what makes the image intriguing. It offers an answer to the question: as LA goes highrise, how does it do it in a way that is in tune with LA’s lifestyle and architectural heritage? But is it going to be built? 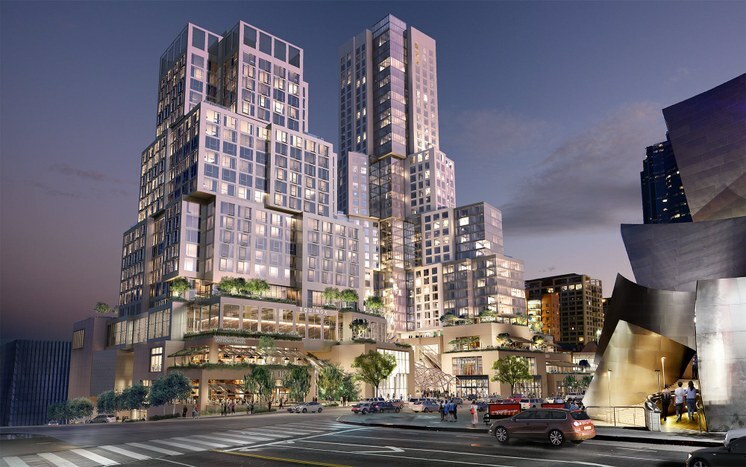 Spokespeople for the developer say the rendering is a conceptual design that still needs to go through an environmental review process and get the LA City Council’s approval. There’s no financing in place yet. If approved, the conceptual design will have to be transformed by the architects into a buildable project. The start date is pegged for 2020. A rendering of The Grand. Image courtesy Gehry Partners/Related Cos. Meanwhile a more important downtown project -- that has been conceptual for quite a while -- is becoming a reality. Today marks the start of construction of The Grand, the long-awaited retail and residential development, designed by Frank Gehry, to be built on Parcel Q, the block connecting Grand Avenue to Olive. This project has been in gestation for around 14 years and at one point changed designers. It is being developed by Related Co. and consists of two towers -- one residential, one hotel -- and lots of dining and shops around a central public plaza over five levels of parking. The Grand Avenue entrance to the development is opposite the Walt Disney Concert Hall. This means a Gehry-designed building will face a Gehry-designed project. How did the design team (Gehry and lead designer Tensho Takemori) handle that? 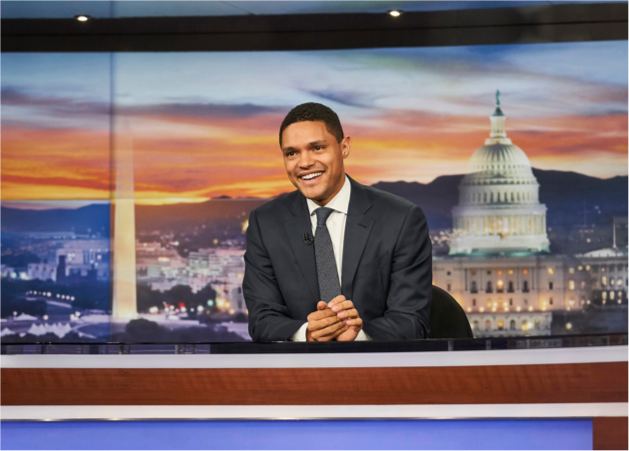 “When you're designing a cultural building that represents and that has to have a representation in the community that is different than a commercial building. So there's two different kinds of architecture play here,” Gehry tells DnA. These differences are partly to do with costs and partly to do with the building type. A cultural building, he means, plays a different role in the urban fabric than shops or an apartment building. A concert hall is meant to have a distinct civic presence. So the styles are quite different. The Grand consists of rectilinear blocks stacked into towers that step back in the way New York towers used to do. The towers will be built of prefab concrete, and there will be glass and some metal features. But they will be far less flamboyant than the concert hall. The main attraction, says Gehry, will be all the new eateries. He and others believe these are key to make Grand Avenue more of a destination. And there’s an emphasis on the outdoor space -- lots of terraces, trellises and plants, says Gehry, that’ll have views onto the concert hall. 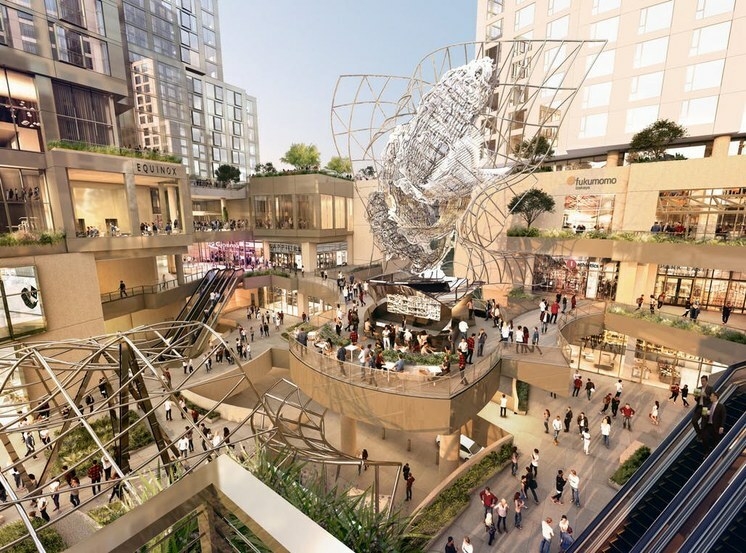 The project does have critics, who’ve argued that this is essentially a mall and that more organic, piecemeal kind of development would have been better. 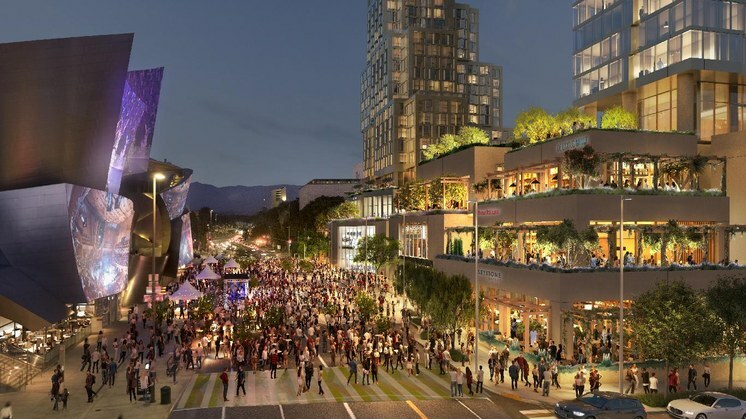 But this is the commercial portion of a public-private partnership with the Los Angeles Grand Avenue Authority to revitalize and re-develop government-owned parcels on Bunker Hill, and Related won the deal to develop the parcel back in 2004. That was back when the Walt Disney Concert Hall had just opened but Grand Avenue was still deeply underutilized -- and powerbrokers like Authority chair Eli Broad were figuring out how to attract people to the top of Bunker Hill . Connecting Grand to downtown to the east -- from Grand Central Market and on through Little Tokyo to the Arts District -- was a big challenge.